Mrs. Yollis' Classroom Blog: Blogging Promotes Quality Writing! Guest post from one of my former students, Nolan. He is a fabulous fourth grader who serves as a blogging mentor for my third graders. Enjoy his informational text and narrative! This is a photo of my brother, Troy, and I playing in the snow in Wisconsin in December. My family goes to Wisconsin almost every summer to see my grandma. We sometimes go in winter, too, as you see in this scenario. My grandma is famous in Mrs. Yollis' class. She has been a great virtual volunteer for all bloggers, and she even has visited the classroom! It snowed a good amount in Sheboygan (the city where my grandma lives) when we were on this trip. But where my great-grandma lives, in Door County, there was maybe almost two times the amount of snow. You can see all the snow in this photo. You realize that we are bundled up, so you can tell that it is freezing. But what you don't notice is that the temperature is 3 degrees! The wind chill temperature range was -8 to -25 degrees! Wind chill is how the cold feels to humans on their skin in certain conditions. Humans have almost like a warmth shield on our skin that protects us from the cold. When a cold wind blows, that protection goes away and the temperature feels even colder. It got VERY cold at some points in time on this trip, but the moment in this photo was probably the second coldest moment that we faced in Wisconsin. It got to -9 degrees when my family stayed overnight on Christmas day at a hotel called Bridgeport. Thank goodness we were inside! I'm surprised my brother and I didn't get hypothermia, or, even worse, frostbite! Eventually, my brother and I were getting cold and tired, so we went back inside. Hike! My brother and I were playing football in my great-grandma's backyard. I'm the one in the neon snow pants. I've got a good tackle going on, right? I think my best play was when I faked left, then ran right, and my brother came for me when I was faking right. He missed me, and couldn't catch up to me at that point. TOUCHDOWN! I jumped into a pile of snow that had just a little more snow than the rest of the yard. I got up, and tossed the rubbery ball to Troy. He looked left, then right, thinking of a play. Then he shouted: "Blue forty-two! Ready! Hike!" Stomp! Stomp! Stomp! He ran full speed to the left of me, keeping distance by running away from me. Thump! I grabbed his torso and brought him down. "Ugh! You got me!" he said. (He is pretty hard to bring down. I guess I got lucky? No, I think it was just my good skills). Have you ever been in very cold weather like this? How are mentors helpful? Have you ever mentored anyone? Leave a comment so I can all hear about what you have to say! Thank you so much for being a stellar mentor from my students. You are not only a fabulous writer, but you are kind and helpful with all you meet. "Quick thinker!" is a phrase I would use to describe you. I remember when we were making our movie and you asked the students what they'd like to blog about. One said school and one said soccer, you quickly chimed in with, "What about playing soccer at school?" You're good! I know you have served as an inspiration for my third graders. They would like to follow in your footsteps (idiom) and serve as a mentor for my class next year. What do you enjoy about blogging or mentoring, or both? I am impressed with your writing skills. I am a great aunt of one of the students in Mrs. Yollis' Class. Yes, I have been in below zero weather with the wind chill in the double digits below zero. I live in Akron, Ohio, near the Great Lake Erie. We do not experience the same weather as Wisconsin. We are now experiencing summer weather. The weather report for today is the temp of 85 degrees. It took a long time for winter to leave, but it has finally gone. Spring was short. it lasted about a month with rains and chilly weather. I imagine you are happy to be living in California weather wise. It's nice to read a comment from you in Ohio! Nolan and I are lucky enough to be neighbors with Chloe Sky and her family. We like to help each other out and look after each other's homes when one family is off visiting relatives in the Midwest! I hope you enjoy the warm weather you are having. Is summer your favorite time in Ohio? What is your favorite "sound of summer"? Thanks for the compliments! I myself think this was a successful post, along with other great ones I’ve made, such as the Gingerbread Mission by Elie and I.
I enjoy being a mentor and blogger because I get to express what I think with others, and they may give their opinion, and that starts a good conversation. Mentoring is nice because I get to give advice to others, and most importantly, help change their comments to be the best they can be. Trust me, if your comments are at the probably best point, everyone will think something like, “Wow. That is one amazing comment. Also, that’s only a third graders’ comment! Unbelievable! I’ll comment back!” Or something like that. Being a mentor and blogger is great! How would or how do you feel about being a mentor/blogger? Your blog post was outstanding! I really enjoyed reading your narrative about playing football in the freezing temperature with lots of snow in Wisconsin. Having been in the warm house watching you and Troy play that football game, I can truly say that your narrative very accurately depicted this frigid event. Reading what you wrote, I felt like I was viewing in my mind's eye an instant replay of that memorable game. When the Green Bay Packers play football in similar freezing, snowy conditions at Lambeau Field, you can understand why they call it the “Frozen Tundra”! To answer your question, yes, I have been in very cold weather as I was born, raised, and still live in Wisconsin, which you already know because you come to visit me. 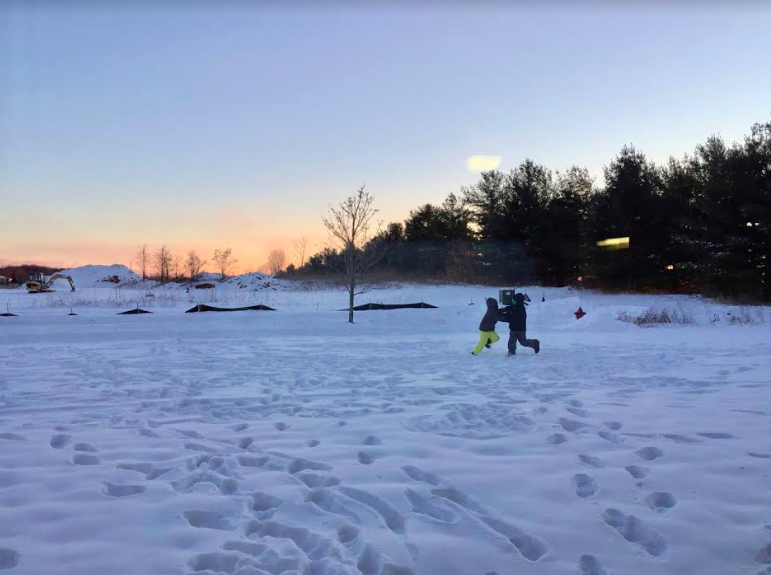 Few in Wisconsin really like that level of bone chilling cold but experiencing it makes us all the more appreciative when warmer weather arrives, or when we go to sunny California during winter, whichever event happens first! You also asked about mentoring. When I was in high school, a neighbor asked if I would help her young son who was in elementary school with his homework. He needed a little extra help with Math and writing skills so I agreed to tutor him. In my senior year of high school I was taking my fourth year of Latin when my Latin teacher asked if I would tutor an underclassman in Latin. Though both of these examples are of tutoring, they are also examples of mentoring because not only was I teaching these students something I already knew but hopefully also setting a good example of study skills to help them in all of their future classes. Tutoring and mentoring are synonymous, which means they are two words that have the same or similar meaning. I am so proud of you for being a blogging mentor to the students in Mrs. Yollis’ class. How does mentoring make you feel? What skills have you honed by being a mentor? I’m looking forward to your next visit to Wisconsin in a few weeks. I can guarantee you it will not be 3 degrees and there will be no snow!